Take your movie watching to the IMAX! There's something magical about sitting in the pitch black of the cinema while new worlds unfold around you and envelope you in their wonders. With tickets expensive, plus pricy popcorn, in this age of VOD services you can watch on home cinema systems growing more impressive by the day, you'd expect nothing less from a trip to the movies. You can't always guarantee you'll love the film you choose but with a few handy tips you can at least make the most of the very best sound and pictures and the finest 3D on the biggest screens to amaze your ears and dazzle your eyes. Avatar kicked off a brave new world of 3D, Clash Of The Titans nearly killed it. Some people love 3D, some people hate it, but for those who are on the fence how do you know when to fork out the extra cash for the extra dimension? Sadly, without reading reviews there's no sure fire answer: Hugo and Life Of Pi proved 3D isn't just about alien worlds and poking you in the eye, while Final Destination 5 showed us there's nothing wrong with being poked in the eye either. One thing that has changed is that post-conversion is no longer a dirty word. JJ Abrams did it for Star Trek: Into Darkness, Zack Snyder's Man Of Steel is post-converted and Alfonso Cuaron's Gravity - heading to cinemas in November - is not only a post-conversion but also one of the best examples of 3D we've seen, featuring the longest post-converted 3D shot ever done, at 10 minutes 47 seconds. If you're going to a 3D screening get there early: optimum seating is right in the middle and about half way to two thirds up. To make it more complicated there's more than one kind and there are pros and cons with each. Most common, and James Cameron's 3D of choice, is RealD. This uses a single projector onto a silver screen, has the lightest and most comfortable glasses and emphasises depth in 3D. But some people say there are problems with 'ghosting' (a shadow image just behind the true image). Dolby 3D uses a single projector onto a white screen. It's newer and according to some has less issues with ghosting and truer colours. Dolby 3D can be darker than RealD, though, and the glasses have fatter arms and are slightly less comfortable to wear. IMAX 3D is the biggest way of watching 3D. It uses dual-projection and according to Brian Bonnick, IMAX's chief technology officer: "IMAX 3D glasses are unique and use the most expensive polarizing materials that have a higher signal to noise ratio to reduce 3D ghosting." Watching two hours of IMAX 3D can be a bit much, however. There's also a company called Xpand which partnered with the Venice and Cannes film festivals. Xpand uses active 3D glasses with left and right lenses that open and close - the glasses are battery powered and heavy and also expensive but Xpand produces universal glasses that also work with 3D TVs. There's no specific definition as to what 4D actually entails. It's primarily used to describe any extra element of interaction in the cinema - generally speaking physical effects. William Castle's 1959 horror The Tingler was famous for its use of 4D - it added vibrating devices to cinema seats that coincided with the action. 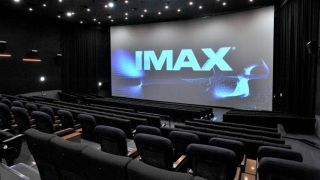 "One crucial component of The IMAX Experience is the patented theatre design"
Often found at theme parks, a few films like Journey To The Centre Of The Earth and Avatar got 4D theatrical experiences and, last April, Japan opened its first 4D cinema in Nagoya, with a screening of Iron Man 3. Viewers can expect moving seats, strobe lighting, bubbles and 1000 different smells. Mostly iron-based smells, we are presuming.